A few months ago, I wrote an article that details some changes you can make to visually speed up Windows 8. This article will go into a few more technical things that you can change to speed up Windows 8 even more. Just like in previous versions of Windows, Windows 8 has services that you might not need, therefore, you can disable those to cut down on RAM usage and background processes. Here are a few services you might be able to set to Manual. Make sure you read the notes next to the items in case it is something you need. If you set something to Manual and notice something isn’t working right after a reboot, you can go back and set them to Automatic. 7.Print Spooler (If you do not plan to use any Printer now or in the near future.) If you plan to use a printer in the near future, make sure you leave the service as it is, because it’s likely that you’d forget that you’ve disabled this service while installing a printer. The device won’t get properly installed unless you start the service again. This had happened to me once and i’ve spend a lot of time to find this was the root cause for not getting my printer’s driver installed on my pc. The registry is a little more advanced, and it can be harder to undo changes if you don’t know what you’re doing. There a different versions of tweaks floating around the internet, but the tweaks I put together are pretty basic and shouldn’t have any negative affects. Copy the following into a new file in Notepad, then save the file as tweaks.reg. Make sure you don’t have .txt at the end of the file or it won’t work. You’ve probably noticed how Windows 8 brings up a lockscreen when you first turn it on, or even after the computer goes to sleep. You have to swipe up on this screen, then you get to the login screen. This might come in handy for tablets, but you might not want it on a laptop or desktop, and instead, you want Windows to just bring you to the login screen. •Press Win + R on your keyboard to bring up the RUN window. •Type gpedit.msc and press enter to bring up the Local Group Policy Editor in windows 8. •On the Right side on window, you’ll see the Do not display the lock screen option being listed. •Double Click it to bring up its corresponding options window and you’ll see three options being shown regarding the lock screen. •Choose Enabled and Press OK.
As you install apps, some of them add things to your system startup, which can slowdown your boot time. Luckily, its pretty easy to find these apps and disable them from starting up. 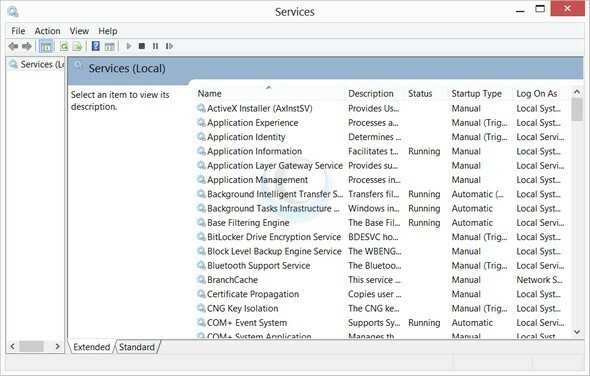 Press Ctrl + Shift + Esc to bring up the Task Manager and click on the Start-up tab to see the programs that start along with Windows 8. Right Click a particular program and Choose Disable. This is an optional tweak, as some people may prefer seeing a thumbnail view of a video or picture. In case it doesn’t bother you, you can disable the thumbnails, which will help speed up folder viewing. Open up Windows Explorer by pressing Windows key + E click on View from the menu bar and choose Options. Click on the View tab and tick Always Show Icons, Never Thumbnails and click Apply > OK.